Heredity, years of wearing tight shoes, and arthritis can all contribute to the development of a bunion — a painful, bony bump on your big toe. 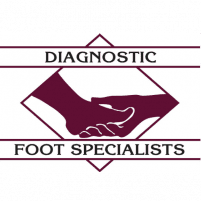 The expert podiatrists at Diagnostic Foot Specialists have more than 35 years of experience providing relief from the discomfort of bunions. This patient-centered practice has five locations in Texas, including Bryan, The Woodlands, and three offices in Houston, including The Heights and The Galleria, so you can get relief from bunions wherever you live in the Greater Houston area. Call one of the offices for an appointment or schedule one online using the booking tool. A bunion is a bony bump that typically forms at the base of your big toe joint. Wearing narrow shoes, heredity, arthritis, or structural problems in your feet may contribute to the formation of painful bunions. Occasionally, bunions form on the outside of your littlest toe. When this happens, it’s called a bunionette. Bunions and bunionettes have similar symptoms and, if left untreated, they can lead to additional complications, like calluses or corns. Bunions usually start small but get larger over time, and may even cause your big toe to overlap the second toe, forcing it out of alignment. Bunion pain can cause a great deal of discomfort, making it a challenge to find comfortable shoes or to walk without further irritation to the already painful joint. When should I see a doctor for my bunions? Bunions are permanent unless a podiatrist removes them; they won’t go away on their own. If you don’t take care of bunions, other conditions could arise, such as bursitis and hammertoes. The highly skilled podiatrists at Diagnostic Foot Specialists offer outpatient treatment methods for bunions in their state-of-the-art facilities, so you can get relief and get back on your feet as soon as possible. When you seek treatment in the early stages of a bunion, your podiatrist may recommend wearing different shoes to avoid putting pressure on the bunion, or limiting physical activity that makes symptoms worse. Custom orthotics to protect the bunion from irritation may also be effective at an early stage. If surgery becomes your only option because of the size of the bunion, your podiatrist offers the latest surgical treatments that reduce recovery time and provide effective, long-term results. To determine which state-of-the-art procedure is right for you, your podiatrist first X-rays and evaluates your foot, considering your lifestyle, medical history, and overall health. The goal of bunion treatment is to relieve painful symptoms and provide long-term pain relief. Learn which bunion treatment is best for you. Call the Houston area office closest to you, or request the next available appointment online.